Overview In 1964, President Lyndon Johnson declared unconditional war on poverty in the United States; and nowhere was this war more photographed than Appalachia. 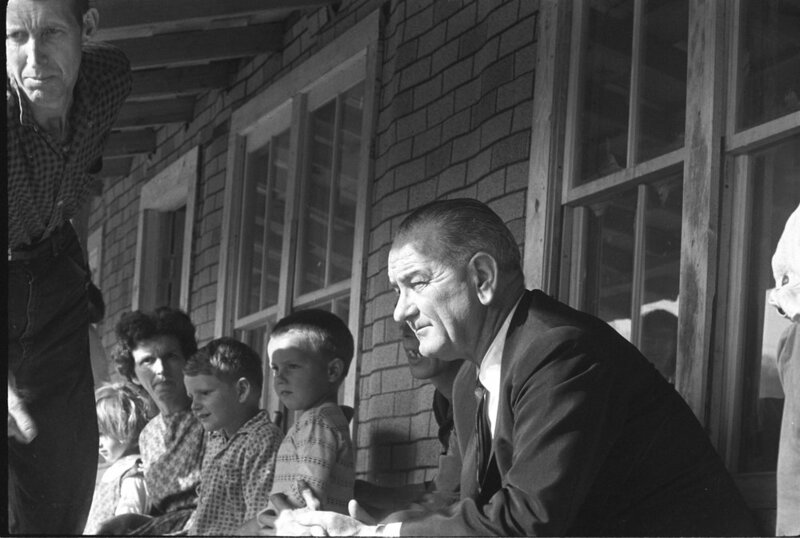 A quick Google image search of “war on poverty” will yield several photographs of President Johnson on the porch of the Fletcher family home in Inez, Kentucky. Many of the War on Poverty photographs, whether intentional or not, became a visual definition of Appalachia. These images have often drawn from the poorest areas and people to gain support for the intended cause, but unjustly came to represent the entirety of the region while simultaneously perpetuating stereotypes. In an attempt to explore the diversity of Appalachia and establish a visual counter point, this project will look at Appalachia fifty years after the declaration of the War on Poverty. Drawing from a diverse population of photographers within the region, this new crowdsourced image archive will serve as a reference that is defined by its people as opposed to political legislation. This project is evolving and I value your input and feedback. Please stay tuned for updates. 1. All work submitted must be the copyright of the photographer. 2. Photographs must be made in calendar year 2014. 3. Photographs must be made in one of the 13 state’s regions the Appalachian Regional Commission defines as Appalachian (here). 4. Submissions are open through 31 December 2014. Please provide as much information as possible about each photograph, but at minimum the date, city, county, and state. Submissions must be in .JPG format, sized at 1500 pixels wide, 72ppi. File names must include your last name and the city and state where the photograph was made (example: maychattaorywv2.jpg). It is imperative that you follow these submission guidelines, otherwise the work will not be considered. Please include a link to your website. Photographs will be indexed by the state in which they were made. You are not limited to submitting work about one state, however please be aware of the ARC map boundaries. To be clear, this project is not seeking poverty pictures. Will poverty be included? Yes. Poverty exists to be sure, however the purpose of this project extends far beyond that. Alabama: Bibb, Blount, Calhoun, Chambers, Cherokee, Chilton, Clay, Cleburne, Colbert, Coosa, Cullman, De Kalb, Elmore, Etowah, Fayette, Franklin, Hale, Jackson, Jefferson, Lamar, Lauderdale, Lawrence, Limestone, Macon, Madison, Marion, Marshall, Morgan, Pickens, Randolph, St. Clair, Shelby, Talladega, Tallapoosa, Tuscaloosa, Walker, and Winston. Georgia: Banks, Barrow, Bartow, Carroll, Catoosa, Chattooga, Cherokee, Dade, Dawson, Douglas, Elbert, Fannin, Floyd, Forsyth, Franklin, Gilmer, Gordon, Gwinnett, Habersham, Hall, Haralson, Hart, Heard, Jackson, Lumpkin, Madison, Murray, Paulding, Pickens, Polk, Rabun, Stephens, Towns, Union, Walker, White, and Whitfield. Kentucky: Adair, Bath, Bell, Boyd, Breathitt, Carter, Casey, Clark, Clay, Clinton, Cumberland, Edmonson, Elliott, Estill, Fleming, Floyd, Garrard, Green, Greenup, Harlan, Hart, Jackson, Johnson, Knott, Knox, Laurel, Lawrence, Lee, Leslie, Letcher, Lewis, Lincoln, McCreary, Madison, Magoffin, Martin, Menifee, Metcalfe, Monroe, Montgomery, Morgan, Nicholas, Owsley, Perry, Pike, Powell, Pulaski, Robertson, Rockcastle, Rowan, Russell, Wayne, Whitley, and Wolfe. Maryland: Allegany, Garrett, and Washington. Mississippi: Alcorn, Benton, Calhoun, Chickasaw, Choctaw, Clay, Itawamba, Kemper, Lee, Lowndes, Marshall, Monroe, Montgomery, Noxubee, Oktibbeha, Panola, Pontotoc, Prentiss, Tippah, Tishomingo, Union, Webster, Winston, and Yalobusha. New York: Allegany, Broome, Cattaraugus, Chautauqua, Chemung, Chenango, Cortland, Delaware, Otsego, Schoharie, Schuyler, Steuben, Tioga, and Tompkins. North Carolina: Alexander, Alleghany, Ashe, Avery, Buncombe, Burke, Caldwell, Cherokee, Clay, Davie, Forsyth, Graham, Haywood, Henderson, Jackson, McDowell, Macon, Madison, Mitchell, Polk, Rutherford, Stokes, Surry, Swain, Transylvania, Watauga, Wilkes, Yadkin, and Yancey. Ohio: Adams, Ashtabula, Athens, Belmont, Brown, Carroll, Clermont, Columbiana, Coshocton, Gallia, Guernsey, Harrison, Highland, Hocking, Holmes, Jackson, Jefferson, Lawrence, Mahoning, Meigs, Monroe, Morgan, Muskingum, Noble, Perry, Pike, Ross, Scioto, Trumbull, Tuscarawas, Vinton, and Washington. Pennsylvania: Allegheny, Armstrong, Beaver, Bedford, Blair, Bradford, Butler, Cambria, Cameron, Carbon, Centre, Clarion, Clearfield, Clinton, Columbia, Crawford, Elk, Erie, Fayette, Forest, Fulton, Greene, Huntingdon, Indiana, Jefferson, Juniata, Lackawanna, Lawrence, Luzerne, Lycoming, McKean, Mercer, Mifflin, Monroe, Montour, Northumberland, Perry, Pike, Potter, Schuylkill, Snyder, Somerset, Sullivan, Susquehanna, Tioga, Union, Venango, Warren, Washington, Wayne, Westmoreland, and Wyoming. South Carolina: Anderson, Cherokee, Greenville, Oconee, Pickens, and Spartanburg. Tennessee: Anderson, Bledsoe, Blount, Bradley, Campbell, Cannon, Carter, Claiborne, Clay, Cocke, Coffee, Cumberland, De Kalb, Fentress, Franklin, Grainger, Greene, Grundy, Hamblen, Hamilton, Hancock, Hawkins, Jackson, Jefferson, Johnson, Knox, Lawrence, Lewis, Loudon, McMinn, Macon, Marion, Meigs, Monroe, Morgan, Overton, Pickett, Polk, Putnam, Rhea, Roane, Scott, Sequatchie, Sevier, Smith, Sullivan, Unicoi, Union, Van Buren, Warren, Washington, and White. Virginia: Alleghany, Bath, Bland, Botetourt, Buchanan, Carroll, Craig, Dickenson, Floyd, Giles, Grayson, Henry, Highland, Lee, Montgomery, Patrick, Pulaski, Rockbridge, Russell, Scott, Smyth, Tazewell, Washington, Wise, and Wythe. The following independent cities in Virginia are also within the Appalachian Region: Bristol, Buena Vista, Covington, Galax, Lexington, Martinsville, Norton, and Radford. West Virginia: All counties: Barbour, Berkeley, Boone, Braxton, Brooke, Cabell, Calhoun, Clay, Doddridge, Fayette, Gilmer, Grant, Greenbrier, Hampshire, Hancock, Hardy, Harrison, Jackson, Jefferson, Kanawha, Lewis, Lincoln, Logan, Marion, Marshall, Mason, McDowell, Mercer, Mineral, Mingo, Monongalia, Monroe, Morgan, Nicholas, Ohio, Pendleton, Pleasants, Pocahontas, Preston, Putnam, Raleigh, Randolph, Ritchie, Roane, Summers, Taylor, Tucker, Tyler, Upshur, Wayne, Webster, Wetzel, Wirt, Wood, and Wyoming.